This week, we're celebrating World Space Week (#WSW16). Today we're focussing on Education and Outreach, an important area in the Agency. 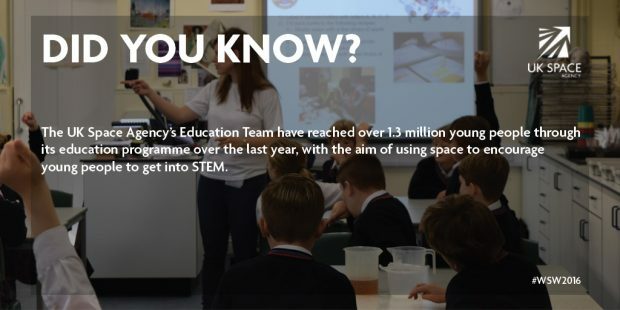 Our team has reached over 1.3 million young people through its education programme over the last year, with the aim of using space to encourage young people to get into STEM. Read Emily Gravestock's account from her recent outreach experience. "Yesterday was an inspirational morning for me, on my second school visit on behalf of the UK Space Agency. Hannah and I spent the morning at Wycliffe Prep school in Stroud working with 120 children aged 7-11 introducing them to a variety of space activities, finishing with two rocket launches. The children had an assembly talking about Tim Peake’s Principia mission (where I enjoyed being dressed in a replica Sokol spacesuit) and the children engaged with Hannah answering questions about the launch and the Principia mission. We then ran activities with the teachers including looking more at how applications of space are used on Earth, how important it is for astronauts to be hydrated, how difficult it is to undertake everyday activities while wearing space-suit gloves (to simulate an EVA) and looking at craters and the vehicles we use to explore them – linking this to the ExoMars mission. The PE teacher introduced children to our ‘train like an astronaut’ programme which they all enjoyed. We then took the children outside and rewarded the one who had been asking the best questions all morning with pressing the ‘launch’ button for our rocket. It was such a pleasure working with children who asked brilliant questions which included the temperature of the moon, the impact of spaceflight on the human body; what we would have to do to colonise Mars and how Sat Navs worked! It really gave me a positive feeling about the work that we do in the Agency and I know has inspired some of those children to explore STEM subjects further. The staff that we worked with were really positive, and all said that they too had learnt something and the head of science is planning to work with some of the children to lead another ‘Space day’ in the future."